A luminous, arched pavilion in Ohio aims to highlight the potential of 3D fabrication techniques, and to so it’s mounting a Promethean stunt. The so-called Solar Bytes Pavilion grabs sunlight during the day and radiates light when it gets dark, recreating the day’s solar conditions minute-by-minute throughout the night. Brian Peters helped found DesignLabWorkshop in 2008, eventually settling in Kent, Ohio. Their latest project is the Solar Bytes Pavilion, a continuum of 94 unique modules (“bytes”) 3D printed in ceramic bricks covered with white, translucent plastic. Peters and his team then put solar-powered LEDs in each of the bytes, snapping them together in a self-supporting, arched pavilion just big enough for a few people to huddle inside. …he used a 6-axis robot arm located at the Robotic Fabrication Lab at Kent State. A hand welding extruder, called the Mini CS, was attached to the robot arm to serve as the 3D printhead, and it extrudes plastic material in a sort of FDM-style process. The technology, provided by Hapco Inc. and called BAK/DOHLE, is employed by universities, government agencies, and concerns like the University of Michigan, Oak Ridge Laboratory, the US Department of Energy, and the University of Tennessee. 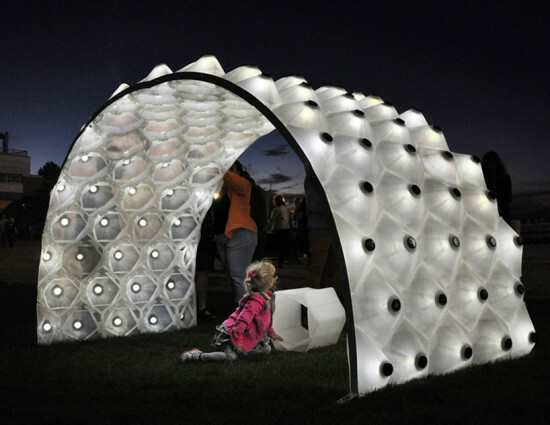 The pavilion debuted at Cleveland’s Ingenuity Fest.